London was getting so big and there were quite a few common street names to confuse the unwary, so London was split up into 8 wedges each with a letter corresponding to a point of the compass and going out about 12 miles, so including places like Croydon, Kingston and Romford. What was then regarded as the central area was categorised East Central (EC) or West Central (WC). The NE and S Division were abolished following a report by Antony Trollope. NE got merged into E in 1866 and S got split between SE and SW in 1868 , so that is how we have the basic letters forming the first part of our London postcodes. Then these areas were getting too large and so numbers were added just around the time of the First World War, which explains if you see original street signs from before this period, they only have the letters and not the numbers. One place you do still find a lot of Edwardian street name plates is in Wandsworth, where they just say SW. At this point or possibly a bit earlier the London district was made a bit smaller to the broadly the area we have today. 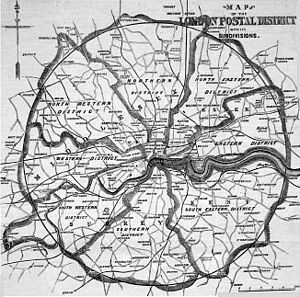 Later when the Post Office created the Postcodes we know and love today, they built on the letters and numbers of the London system to form the base of the post code of today. In a few high density areas it was necessary to split the post code district. Initially this was only done in EC, WC, SW1, and W1 where the whole district was sub divided. More recently bits of E1 and N1 have been subdivided, so there is E1W, N1C and N1P but the rest of E1 and N1 are not subdivided. A very British way of resolving a problem! The post code area bear no resemblance to any administrative boundaries and in fact there is one little bit of the London postal district which is outside the administrative area of Greater London – that is part of E4 which covers Stewardstone in Essex – part of Epping Forest district. Im interested in the SE postcodes and apart from SE1, Southwark, they appear to be alphabetical until you get to SE19 and then we have the Dulwich/ Norwood area as an afterthought. Does anyone know why this area is out of sync? Im assuming it was added later so does anyone know when please? SE28 – Thamesmead (the area built in the 1960s’, shared between LB Bexley and LB Greenwich, created from the carving of SE2 (Abbey Wood) and SE18 (Woolwich) postalcodes. Thanks for your help with that reply. SE1 is the Head District, therefore, ‘nameless’. NW11 and SE 28 were divided from larger postcodes (NW4 and SE2) , so break the alphabetical system, while SW is alphabetical half way and starts again in the middle. There is another London postcode which creeps beyond Greater London, although the Post Office reduced the amount recently, where NW7 goes over the border at Borehamwood over the A1. I was born about a mile and a half from NW9, i’ve always wanted the Post Office to expand the postcodes to the Greater London border. I was having a chat with a bloke from Battersea and he asked where i was from i said i was born in the London borough of Harrow, he ‘ummed and ‘arred and said well it’s not really London, then i explained that south of the river was Surrey originally and north of the river was Middlesex. My mum was born at Newington Butts near the Elephant and Castle but, as you say, everything south of the ‘river’ was Surrey back then. Hello and thanks for the informative site. Looking through the history of London postcode development, every account I’ve read seems to start with the original “12 mile radius” plan, then explain the abolition of NE and S areas, and the contraction of the E area, then jump to the subdivisions in 1917 to give us more or less what we have today. But I can’t find any info on how/why/when they reduced the original 12 mile zone so that places like Enfield, Croydon, Harrow, Twickenham etc ended up outside it. In fact the average radius now is more like 8.5 miles so it was quite a substantial change. Do you have any info on this? I do not know the answer for sure but I suspect it was practical. The Post Office would have had to move all the post in each wedge to a central place to sort it. But in the outer areas much of the mail would probably have been local (ie people in Croydon writing to others in the area), so why bring all that local post into the centre to sort. It would have been easier to keep the Twickenham post in Twickenham and the Harrow post in Harrow and so on. But as you say there seems to be no information explaining how the decision came about, or indeed when this happened. I am not clear what you mean. Where did I refer to “special” head district? I was led to believe that the postcode numbers are in alphabetical order, such as E1 Aldgate, E2 Zbethnal Green, E3 Bow, E4 Chingford, E5 Clapton, E6 East Ham and so on..
Well yes and no. If you see my list of postcodes by name, you will see they are not entirely in alphabetic order, as number one is the head district and without a name, except in W where W1 is special and the head district is W2, then SW and SE both have two sequences, and there are some aberations, such as NW11. When Greater London was created in April 1965, the Greater London Council wanted the Post Office to change all addresses and postcodes within the expanded Greater London area to LONDON. The Post Office refused as the cost of implementing such a change would have been colossal, both to the Post Office and the wider economy. Hence why we have post towns and non-London postcodes in outer London. Thanks for the comment. As you say this explains why we have other post towns and non London postcodes in outer London.